Nowadays more and more car brands, more and more types of vehicles. Of course, the type of Auto Parts is also very diverse. For example, the hub adapter, ATV wheel washers, Wheel Nuts. Now let's talk about the wheel nuts. Popular Thread Size: m12x1.5, m12x1.25,1 to other dimensions: M14x1.5,7 / 16, m12x1.75, L31, L36,142 or any custom length. It can enhance your wheels shine and provide maximum reliability and strength. 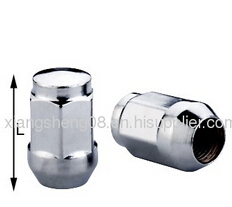 Each lug nuts are cold extrusion equipment manufacturing precision fasteners criteria used. each nut is then hand polished before plating, the results are a longer-lasting superior chrome finished.